Garages and workshops are cold places to work in the winter time - unless you have a good garage heater that is! 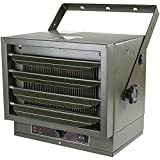 There are a lot of heaters to make working in the cold months much more productive, and choosing the right one is key. To help you navigate through your many options to easily decide on the ideal one for you, we have put together this shopping guide which will have you warm and toasty in no time. There a lot of garage heating options out there, and finding the right one for your space and needs is paramount to staying warm and safe this winter. To help you compare and choose garage heaters, here is what you need to know about each. Electric Garage Heaters: These easy to use, low maintenance garage heaters are both quiet and odorless, and available in four variations that are easy to instal: Commercial garage unit heaters, mounted to either the wall or the ceiling, have large fans that heat spaces quickly making them ideal for large garages. Wall garage heaters are perfect for small to medium garages, ceiling garage heaters are great space savers, and plug-in portable electric garage heaters give owners the flexibility to bring heat with them as needed. 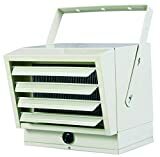 Infrared Garage Heaters: Infrared Garage heaters, also great at aiming heat at a specific area, do not use fans which make them a much quieter option. 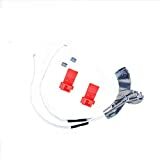 They are ideal for those small areas where you want to keep noise down and concentration up. Gas Garage Heaters: These industrial heaters can heat up large spaces quickly and are also an ideal choice for dealing with water damage restoration and construction drying. Gas garage heaters come either vented, with its ventilation system pumping air directly out of a hole in the wall, or ventless, which requires the room being heated to have good ventilation. 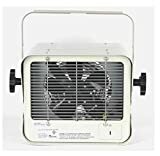 Propane Garage Heaters: Not only are propane garage heaters quick and durable, but their fans can double up as an air circulator in the warmer months. 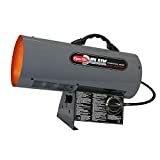 These heaters are powerful and are best suited for directing air in low profile spaces. Radiant Garage Heaters: These handy heaters are quick and efficient. They provide simple spot heating, like the warmth given from the sun’s rays, to objects in a room, and are perfect for people wanting to heat a certain workstation area as opposed to an entire room. Thermostat: Garage owners tend to rate garage heaters much lower if their thermostats are not constant. This is a concern as it may mean different peak temperatures at different times of the day. To get the most out of your new garage heater, look for one with an adjustable thermostat that is reliable. Reading product specs and consumer reviews beforehand will save you from possible disappointment. Build: Garage heaters are an investment, and buyers who have opted for quality brands that are easy to install and have durable builds rate their models much higher. Operation noise: This is a big concern for reviewers needing peace and quiet, and heaters offering softer operation and running noise are rated well. If you require your garage heater to be quiet in order for you to listen to music or machinery or talk to workers while working, choosing a top brand that is reviewed as quiet will be a much more valuable option for you. Heat: The most important factor to think about is the heat that your garage heater will provide. Buyers who have chosen the correct size (and power) garage heater for their workspace are a lot more satisfied. They also value the heater more if it is quick to heat up and if the heat is distributed around the space effectively. Garage heaters offer two installation options - plug-in and hardwiring. If you are looking for a less permanent option, plug-in garage heaters are quicker to set-up and offer more flexible movement. Hardwired garage heaters will provide you with more security and are ideal for people needing to save valuable workspace. Checking the voltage power specs of your new garage heater will ensure it is compatible with your workshop power supply. Your average model should include 110-120 volt plugs, which is compatible with regular outlets. Alternatively, for more industrial heaters you may need an outlet to handle up to 240 volts. When determining the size and wattage your new garage heater should be, consider if your workspace is insulated or uninsulated. Non-insulated spaces will need a stronger unit as they require a lot more heat. The more watts or BTUs your garage heater has, the bigger the room your heater will be able to warm. Garages tend to be much colder because of their lack of insulation and therefore purchasing a garage heater offering a higher wattage will serve you better. Adjustable louvers is a garage heater feature which will make it possible for you to direct the heat to a specific area that needs fast warming. There are many safety features to consider when buying your garage heater. A tip-over switch will automatically switch off your portable floor garage heater unit if it is knocked over, while cool touch housing will ensure no burns if you accidently touch the device. If you decide to go for a non-mounted heater, finding one that is built for convenient movement will save you a lot of hassle. 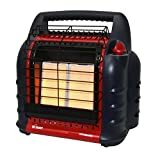 A long power cord will give you more placement options, a carrying handle makes picking it up easy, and a wheeled model will allow you to move your bigger heaters quicker. When choosing a mounted garage heater, consider attaching it to the common wall between your workshop and house to get best thermostat longevity and efficacy and keep your home away from the heat. Some ventless gas garage heaters come with an oxygen-depletion-sensing shut off system. This is a very good feature to invest in as it will make it possible for your heater to read if there is enough fresh air in the room and to automatically switch off if not. Gas garage heaters with a separate combustion chamber are a must for areas where you will be working with wood or using spray finishes. This is because instead of burning dusty or paint-filled hair, which is unhealthy and dangerous, they will draw air from outside to burn. If you want to heat a very small portion of your garage, or other small spaces, space heaters may be a better option. Fahrenheat: Fahrenheat is the heater brand of Marley Engineered Products, and is based in Bennettsville, SC. They make a wide range of energy-efficient electric heaters, from personal to heavy-duty garage heaters, and all their products are manufactured in the US. NewAir: NewAir makes a wide range of home appliances, from ice makers to garage heaters. Their blog is a great source of information about the science behind and best use practices of their products, including garage heaters. 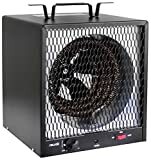 Dr. Infrared Heater: Dr. Infrared Heater bring factory direct pricing to consumers by selling products manufactured by the same factory that supplies Sears and Home Depot direct to consumers. They only make heating products, so you can be confident their garage heaters are up to the task. Dimplex: Dimplex North America Limited is an electrical heater company headquartered in Ontario, Canada. Dimplex invented the modern electric fireplace, and offers a wide range of garage heaters.